SUMMARY: In the new landscape of accountable and value-based healthcare, patient registries are a straightforward tool for creating realistic views of clinical practices, provider performance, safety and comparative effectiveness, and for supporting evidence-based medicine development and decision-making. 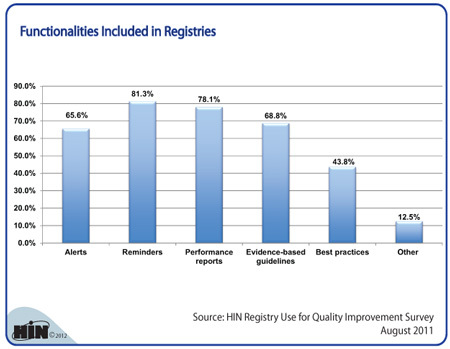 We wanted to see which functionalities are most often included in patient registries. 2012 Benchmarks in Patient Registry Use for Accountable Care is available from the Healthcare Intelligence Network for $127 by visiting our Online Bookstore or by calling toll-free (888) 446-3530.